Les Manques is a family home, set in a beautiful valley only 10 minutes from Castelnaudary, on the way to Mirepoix, and lovingly created from a shell of a stone barn into an outstanding property with large open lounging and dining areas, spacious bedrooms with en-suite bathrooms throughout and high quality fixtures and fittings and gas central heating. There are large private gardens and two lovely terraces suitable for outdoor dining (one shaded, the other south-facing – both with spectacular valley views) - flower and grass gardens across different levels, an orchard next to the heated infinity pool and an established vegetable garden. There is an independent studio apartment built apart from but facing the main house. This is a very private building with small separate terrace next to a formal garden and includes en-suite shower, bath and sauna. We have a long drive leading to huge open parking and double garage. There is a private 12m, heated infinity pool with fabulous, uninterrupted, views of rolling hills and valleys, including 10m2 “beach” area (suitable for supervised water-play for very young children). There are wonderful gardens all around the house and a shaded summer kitchen (with built-in barbecue, pizza oven, fridge, stainless steel food preparation area, Belfast sink and dining for at least 12 people). Solid oak 1 1/2 doors lead to entrance hall with slate floor and cast circular staircase to first floor. High gloss Hanak kitchen incl three spacious Corian work surfaces. Induction hob overhead light and extractor, double oven. Central island unit with sink plus 5m “S” worktop with overhead lights. Slate flooring. Door to utility room with additional storage, belfast sink, washing machine and dishwasher. Cupboards incl 300l water tank. Kitchen leads into dining and lounge area with solid Oak wide-plank flooring and 14kw wood-burner. Two 5m bi-folding doors lead onto 80m2 travertine marble terrace with views along the whole valley. Door from lounge through to library (can be used as guest bedroom as this also leads back to the ground floor WC/shower room). French doors out to front terrace. Large double bedroom with solid Ash floor, en-suite bathroom, traditional roll-top bath suite and feature stone wall. Build-in wardrobes. 5m French windows leading to private balcony. Large double bedroom with solid Ash floor, en-suite wetroom, steps to raised platform (has been used as sleeping area leaving bedroom space as private lounge). Built-in wardrobes. 5m French windows to private balcony. Double doors lead to 75m2 Master suite with solid Raintree flooring, two 5m bi-folding doors leading to private balcony overlooking the whole valley. Large cast iron slipper bath, wetroom, separate wc, private lounge. Entire wall (c.15m) of built-in wardrobes. Private entrance, large lounge through to sleeping area, small kitchen. En-suite bathroom with free-standing bath, walk-in shower and built-in sauna. 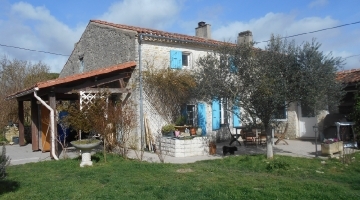 This would be ideal as guest accommodation, nanny flat, granny annexe or even gite/b+b rental but could also be used as a studio or workshop. 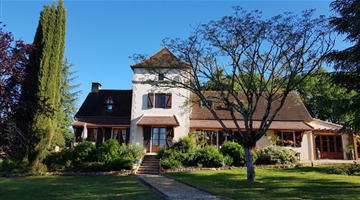 Within a short drive of Les Manques you can see historic castles, abbeys and ruins; sample local wines at numerous vineyards or gourmet food at nearby restaurants; buy locally-grown or produced food at picture-postcard markets; learn to sail, windsurf or water-ski; go rock-climbing, abseiling or pot-holing; see ancient cave paintings, visit a wolf park or African Reserve; fish for trout; ride horses through forests and lakes; lounge on a beach; watch the Tour de France or even pop to Spain or Andorra for lunch! 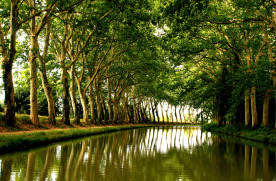 There is a varied and impressive landscape; from the dramatic mountainous peaks of the Pyrenees to the gentle rolling foothills and flat plains of the Lauragais with its sunflowers, cereal crops and vineyards, all of which provide a wealth of opportunity for photographers or painters to capture beautiful scenery, wildlife (particularly birds of prey) and clear star-lit skies. 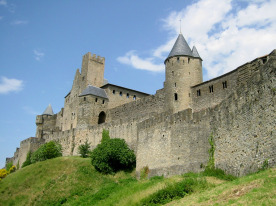 The Aude and Ariege regions are historically known as Cathar Country where the crusades against the Cathars took place at the beginning of the 13th century and a wealth of Cathar fortresses, castles and ruins remain for you to visit. 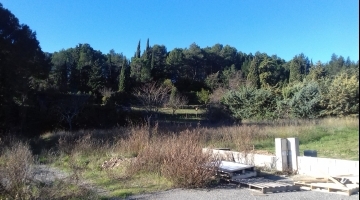 With a climate of over 300 days sunshine a year, the Aude is part of the Languedoc Rousillion - the biggest wine growing area in France where you can sample local wines such as Cabardes, Clappe, Corbiers, Fitou, Malapere, Minervois, Muscat plus the impressive Blanquette or Cremant de Limoux which is the region’s own sparkling wine, thought to be the fore-runners of champagne. 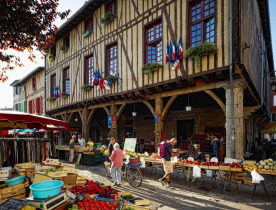 Beautiful medieval villages sit on hillsides and grand cathedrals adorn the sun kissed market squares. Open air cafes, traditional street markets and shuttered houses create an ambience typical to this part of Southern France.